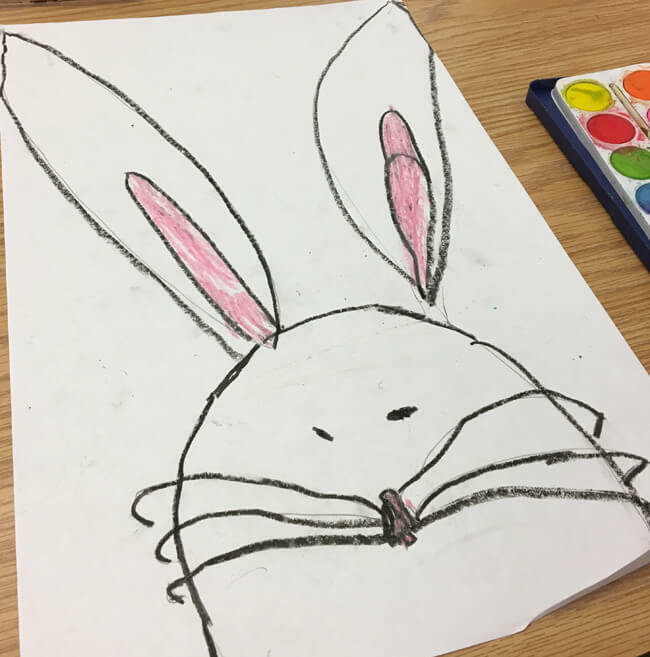 Yesterday my class and I were talking about Easter. One of the kiddies said that her Easter last year was very strange because the Easter bunny showed up the next day! Then another child said the Easter bunny didn't even come to his house, but instead showed up at Grandma and Grandpa's! Right then I knew I had to read them The Big Bunny and the Easter Eggs because THIS book explains why sometimes Easter might just be a little strange. 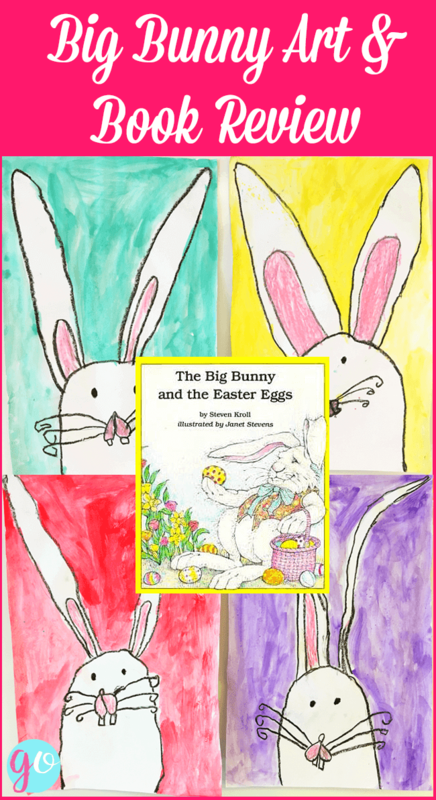 Synopsis: This sweet book is all about Wilbur the Easter bunny who gets very sick on Easter Eve. There's no way he can deliver the eggs in time without the help of his four bunny friends. 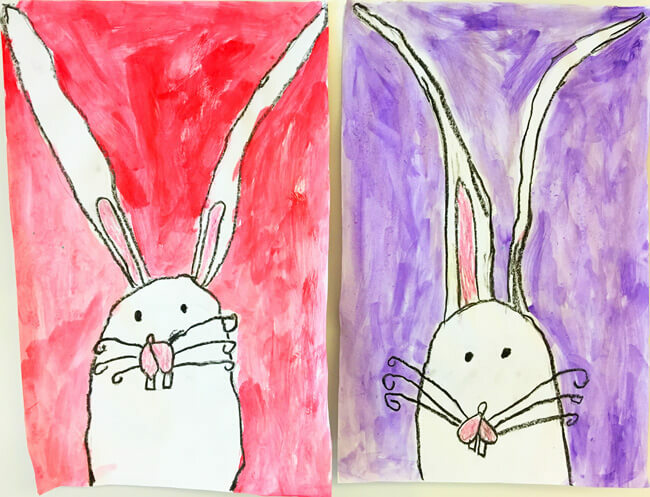 Bunny Art! 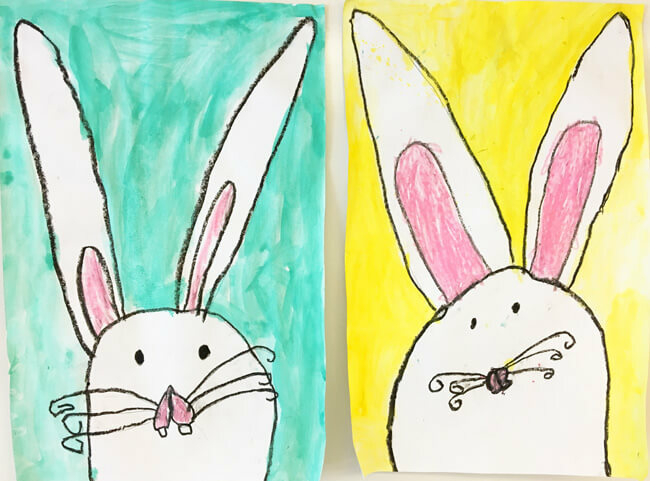 I found this fabulous art activity on Artventurous, which you'll definitely want to check out because she illustrates step-by-step how to draw these cutie pies. 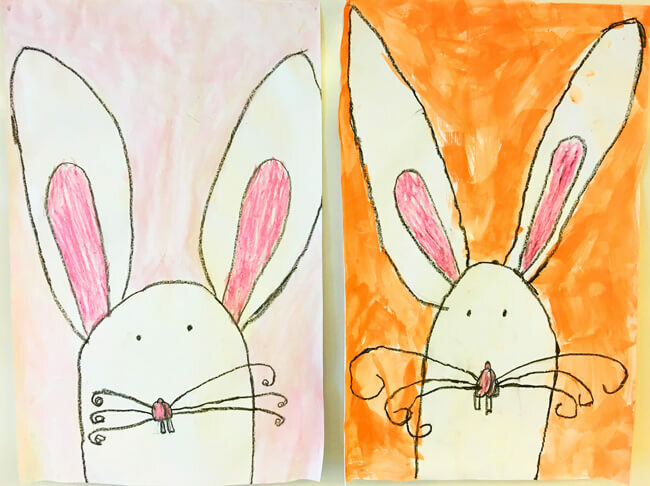 We followed the instructions and drew our bunnies. 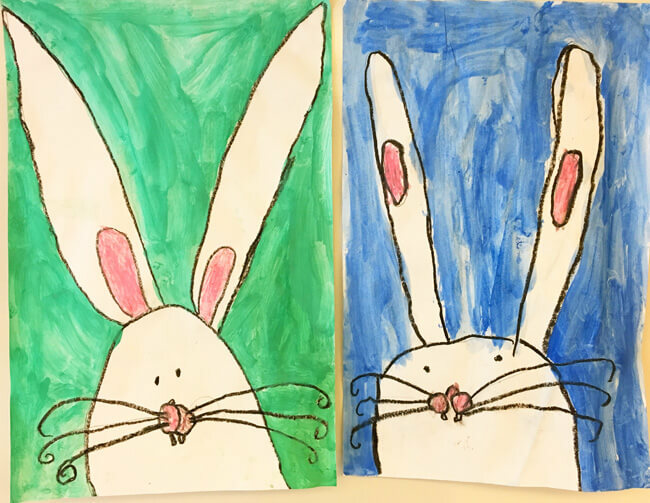 Then we outlined our bunnies in black pastel and coloured in the ears and muzzle. Then it was time to begin the paintings! Everyone used their own pan of watercolours (the cheap ones you can buy in office supply stores) but I provided them with big brushes. They were instructed to use any colour they liked (except brown and black) and to paint the background. I just think they're the sweetest paintings ever and they look so colourful and festive hanging in our hallway. 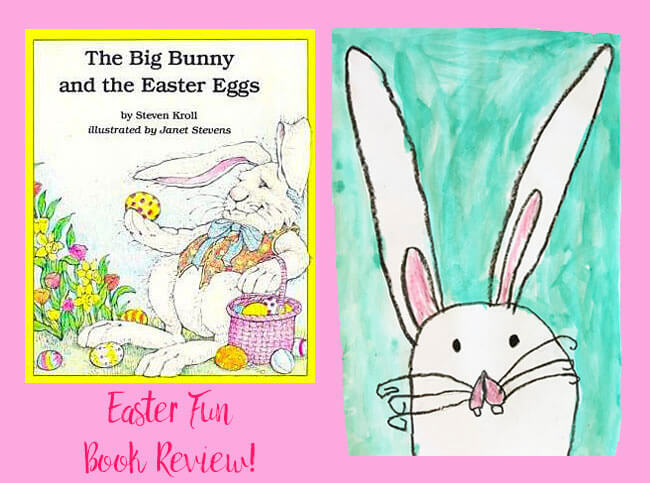 You can find more fabulous book reviews at Perfect Picture Book Friday, hosted by Susanna Leonard Hill. 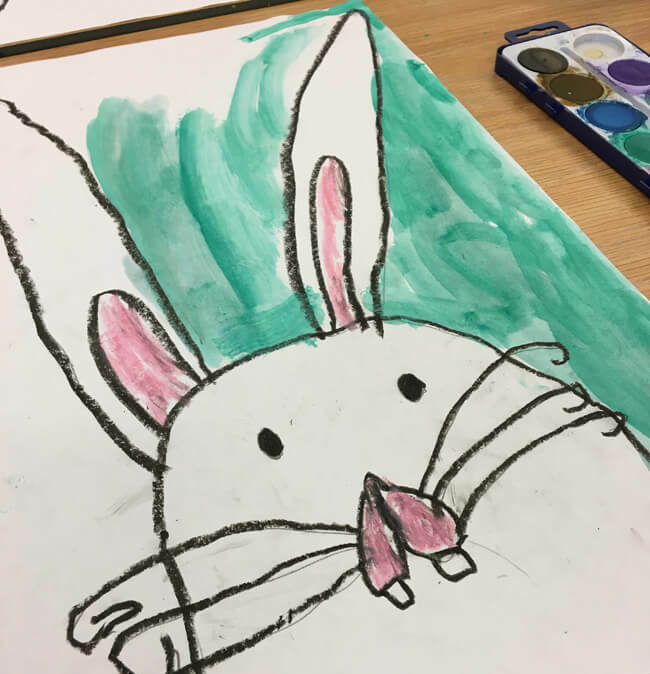 Thanks for stopping by and if you have a fun Easter activity you'd like to share, please leave a link in the comments. Cute, cute, cute. I loved the pics your kids did. Very colourful and a great idea. This was one of my daughters favorite books as I child. We read it over and over. She now teaches first grade and I bought this for her personal classroom library.